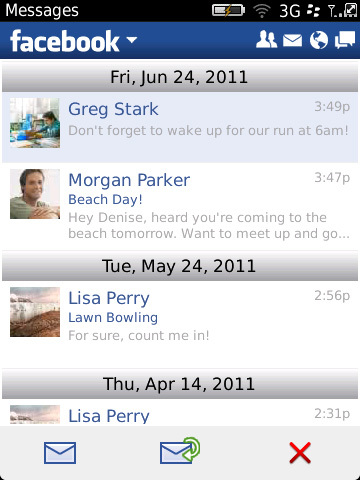 The Facebook 2.0 client is out for both current edition BlackBerry smartphones and the new BlackBerry Playbook. Facebook Places – Users choose to share where they are, what they are doing and who they are with – with Facebook friends. Get directions to and from a Facebook Places by clicking on the map image, which will seamlessly launch the Bing! Maps on the BlackBerry Playbook. 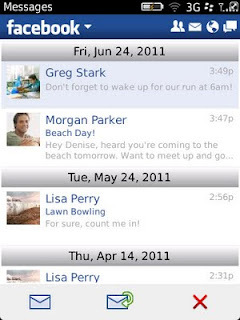 Facebook Events - View events and birthdays and receive notifications of new invitations. View event details like the time, place, guest list and more. Users can even RSVP and write on the event’s Wall. View ‘Likes’ - See the names of the friends that ‘liked’ a user’s post. Users will also be able to tap their friends’ names to launch directly to their profiles. Privacy control on status updates - Control who can see each update users share. Simply click the lock icon in the lower-right corner of the status publisher to select who to make the status update visible to before posting it. As my long time readers know I own a BlackBerry Curve 8330 and most recently used a BlackBerry Storm2, which I had to turn in for a Droid Pro back around February. I miss having my BlackBerry and still think about picking up a new Bold at some point.